Anemometers are used to measure the speed of wind and they make up for one of the most basic parts of all weather stations. They are available in many types in the market and choosing one can be quite a complex process. This is because that they all come with different functionalities and styles. To be able to make the right decision, you will need to be equipped with as much information as possible on the instruments. Below is some very useful information. Vane Anemometer – its mechanism is very similar to that of the cup anemometer with the difference being that it comes with sensors that have the shape of a turbine or windmill and they rotate on a horizontal axis. Hot Wire Anemometer – this particular one comes with a very thin wire that gets electrically heated and then gets cooled as the wind blows by. Heat loss conversion is then done to get the air velocity. Pitot tube Anemometers – these ones basically measure the wind pressure which is then converted into a reading of the speed of the wind. Sonic Anemometers – these happen to be the most advanced of all of them and they use ultra-sonic sound waves to get the speed of the wind. This is one factor that you should forever prioritize when looking at the suitability of an anemometer. The best one to go with is one with an accuracy reading of not more than ± 5%. The recording of the wind speed is another very crucial factor. It is important that you go for an instrument whose reading ranges from at least 0 to 100 mph. It should also have a very quick response as the it is very possible for the speed of wind to fluctuate very fast; the instrument should be able to capture the fluctuations no matter how fast they are. It is definitely important to consider the size and design of anemometers that you will be taking in regard to the location that you will be placing it. The size and design of the instruments have an impact on the accuracy of the information that you will be getting. Keep in mind that the anemometer will normally be placed outside and will be exposed to various weather conditions. It is important that you get one that has been made with high quality materials that enhance durability. Color becomes important if the instruments will be used in areas prone to icing due to the thawing factor. Black ones tend to thaw faster than the white ones. There are so many other features that you also need to consider such as the mechanical and electrical components, maintenance, clean-up among many others. 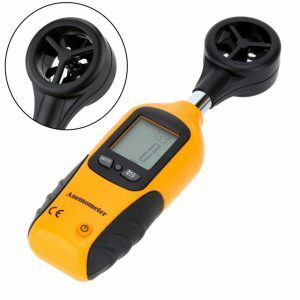 The important thing is to make sure that you have gathered enough information before you go out to buy the anemometer itself.